Poison Oak, Poison Ivy, Poison… Get away from me!!! This weekend we did a night hike in Los Angeles. I love night hikes- you can’t see anything but what’s in front of you. Bad thing? You can’t see anything but what’s in front of you. 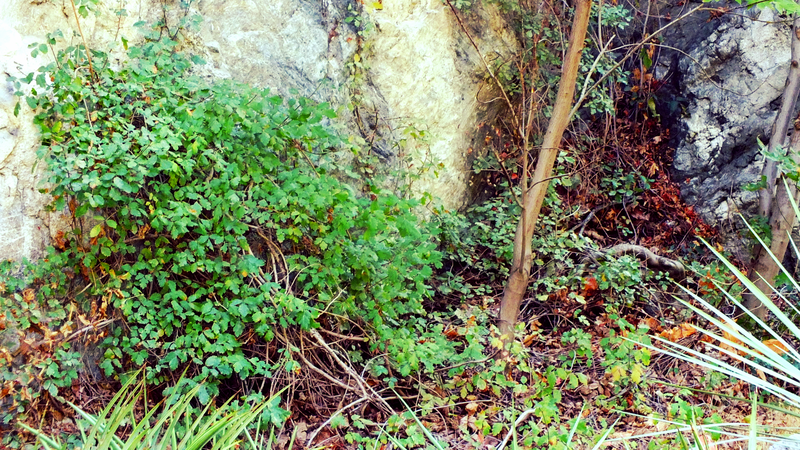 We were hiking back and, to my surprise, there was poison oak ALL over the wall!!! 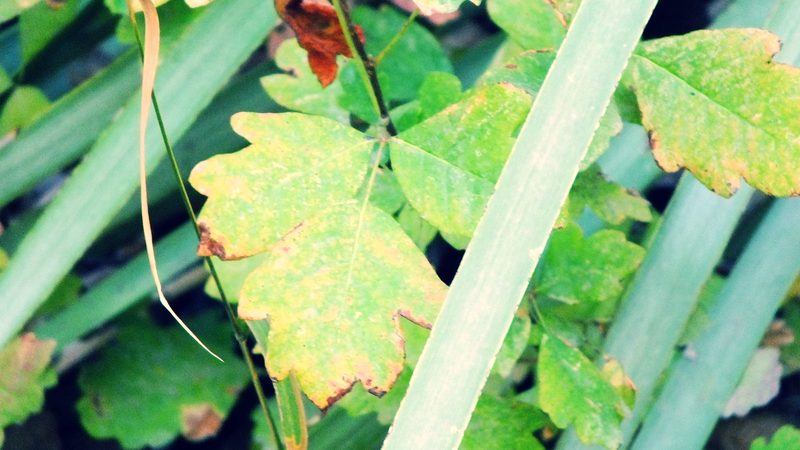 Here are a few quick tips to tell the difference between poison oak, poison ivy, and everything else! 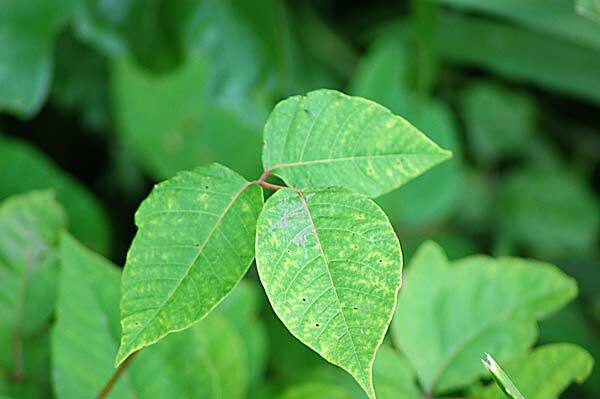 Poison Oak and Poison Ivy have the same characteristics so look for this- a cluster of leaves in a group of three- one at the top and two on the bottom that are conjoining (refer to the above picture). Ivy is more “leafy” and solid while Oak is more rugged. Signs you have brushed up with some poison? 3. Treatments? Take off and wash your clothes, cold compress or cold water, antihistamines (Benadryl), aloe vera, non-scented lotion, do not scratch!! 4. Prevention? Wear the appropriate clothing, be sure how to spot it, bring preventative measures like rubbing alcohol just in case. 5. Weird remedies: acorn bath, baking soda, dairy, tea, chilled fruit rinds, cold coffee, apple cider vinegar…. Now it’s your turn: What’s your home remedy, ways to tell, and just flat out poison Oak and Ivy stories? See – it all just looks the same to me – it looks just like all of the other leaves and bushes out there, thus, I only follow where many have already tread! I only walk on very well worn paths or on the roads (when camping). I can’t tell the difference and am very freaked out over encountering it! And the hard thing is its where areas are very well encountered! Most of the poison oak we saw was on rock walls too..
I’m not sure if I’m actually allergic to the stuff- my dad isn’t, and I may have inherited that. I’ve been out in the woods enough, and careless enough, that I should have had it by now. I’m still careful around it anyhow. However- my cousin once sat in a big patch of poison ivy at night during a late summer camping trip, not knowing what she was sitting it. It went up to her shoulders when seated. I have never, ever seen such a bad case. She had to go to the hospital, and she missed the first two weeks of school that year. All of the skin on one leg, half the skin on the other, most of her torso, both of her arms, her neck, part of her scalp. Yeesh. It *peeled*. After about three weeks. Oh no! Glad she’s ok! Thanks for the info. I grew up in the mountains in Eastern WA and OR and have somehow never seen it! I’m not sure if I’m immune to the stuff or not, I think that I am. However, I’ve had friends who had severe reactions, I’d rather not go through that! I’ve only had a few encounters with poison ivy as a kid. Back then I would just jump in an ice cold shower and numb everything that itched. If it did itch outside of the bath, I’d just sit there hitting it while rubbing some cream on it, the name of which I cannot remember for the life of me. To add a little bit to what you and trekker said…the oils in the plants are the irritants. After exposure, when you take your clothes off and get ready to wash them, be careful how you you handle them and what those clothes come in contact with since the oils will likely be on your clothes too. If you’ve already washed yourself you have a good chance of getting another dose. Also…thse oils can hang around a LONG time…6 months or more. Yes! I’m glad you mentioned to be careful handling your clothes! That stuff doesn’t just disappear and go away! He had gone through a bush, and not too long afterwards he left the trail to go pee. For the next two weeks, every time we saw him, he’d complain about how much his junk itched. It left an impression, I’ve always been especially careful to stay away from the stuff. Oh no! Oh of my friends had to pee in the woods and squatted in it! Yikes!! This is good information – I wonder if these plants are in the Uk too? or whether they are native to the US only? I believe the “universal solution” (distilled white vinegar) will kill the itch (by removing the oils from your skin), as well as kill the plants (this is in response to MrBream’s end-of-the-driveway ivy patch and not meant to condone rampant herbicide of wild plants in nature!). Simply spray undiluted vinegar over the leaves and at the base of unwanted plants, sit back and watch them turn brown, wither and DIE. I no sooner got into the eastern campgrounds at Smoky Mountain NP and Shenandoah NP on my weeks long trek from LA than I came in contact with poison ivy. I was cursing the east environs. I am super sensitive to this stuff but can never seem to recognize it. Took nearly a month to be rid of it. Little to no poison oak in the east and I have yet to come across it in my western adventures. Maybe I’m damning the east coast too much. Thanks or the heads up. And thanks for dropping by my blog! Swimming in a chlorinated pool helped me dry out the skin and taking a bath helped when I was a kid. That’s a great idea! I wonder if that would be contagious to other people in the pool? But chlorine does dry out the skin- great idea! thanks! Thanks for liking my post about my hike on the Appalachian Trail! The Georgia AT had a lot of poison ivy, but it strangely disappeared when I hit North Carolina. My treatment is to run progressively hot water over the rash, until it stings. Then pat gently with a towel and apply Benadryl or Calamine. This stops the itch for several hours and helps me sleep without itching. Sometimes I just scratch the hell out of it until I bleed. I’d rather have a sore/scab than the itchy rash. Strange remedies, I know, but after a lifetime of poison ivy this is my way of dealing with it! You have a really nice blog… thanks again!